After my disappointing trip to Ripley’s Believe It or Not I decided to treat myself to a quick bite to eat at a well-known nearby place called Ed’s. 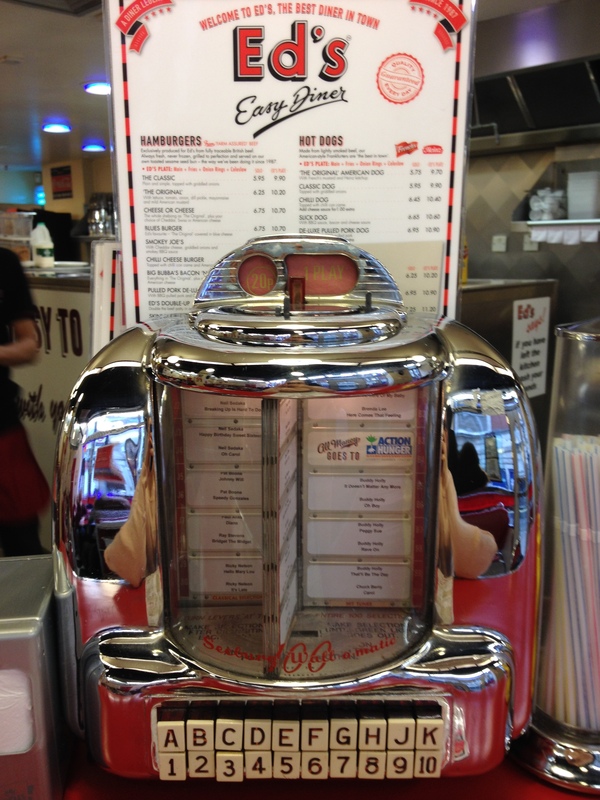 Ed’s Easy Diner is actually a chain of retro-American restaurants although when you’re there it doesn’t feel like it is. The one in Cardiff is now pretty famous for having been used in the Doctor Who episode The Impossible Astronaut and I’ve eaten there a couple of times but this was my first trip to the Trocadero branch. The menu has barely changed in the last 27 years since the first Ed’s opened and why would it when you’ve got old favourites of burgers, hot dogs and fries on the menu. 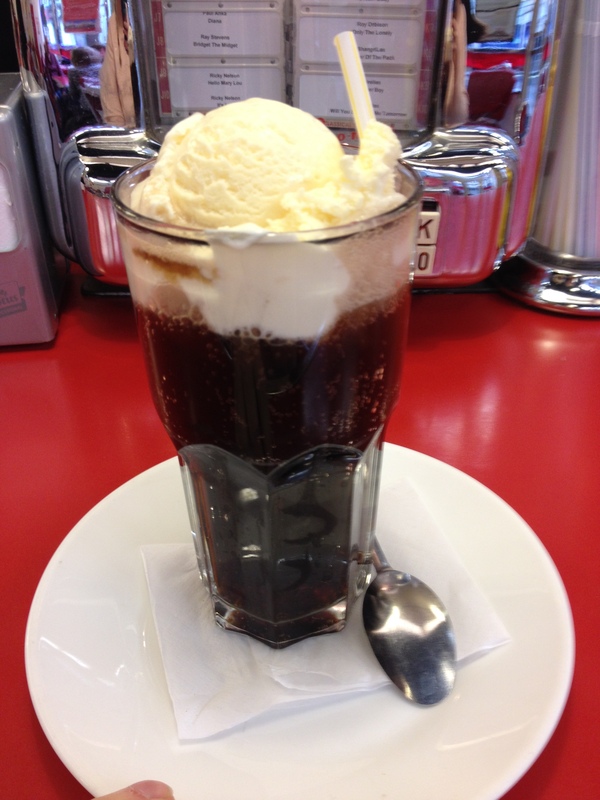 I chose to start off my meal with a good old coke float. I hadn’t had one in years and it went down a treat! The ice cream was good quality which made it all the better. I also know from my experience in Cardiff that Ed’s happen to have some of THE best milkshakes around so do try one if you get the chance. You can either have your meal solo or as a plate including main , fries, onion rings and coleslaw. 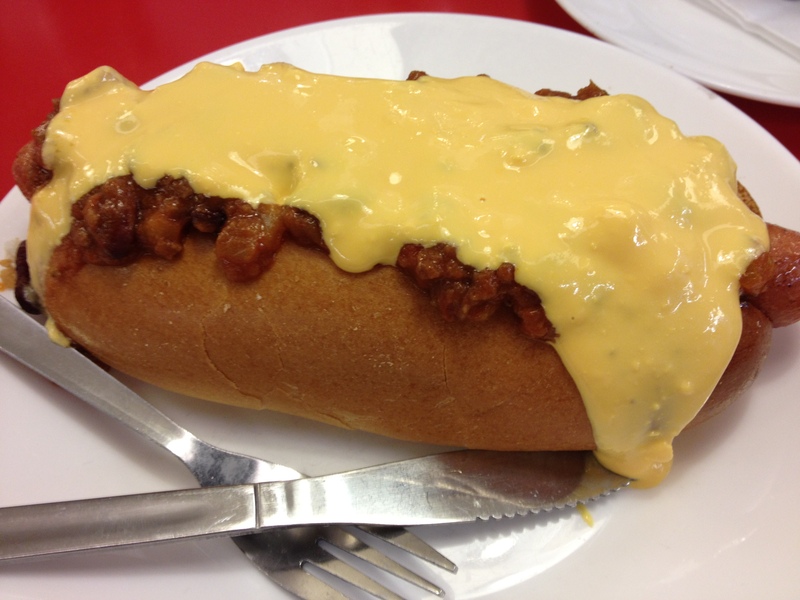 I wasn’t overly hungry so settled on a solo chilli dog with cheese sauce. It might not look impressive but it was actually pretty big! It was impossible to pick up without getting cheese or chilli all over your hands so I had to use a knife and fork and I struggled to finish it so was really glad I didn’t go for the plate option. The atmosphere at Ed’s is really nice too with the place mostly filled with families enjoying an old-fashioned American meal and music from the 50’s. I was sat up on the bar rather than taking up a whole table and there were mini jukeboxes where you could select a song to play for 20p proceeds from which go to Action Hunger which I thought was a really nice touch. I’ll definitely be back at Ed’s in the future, in fact I think I may have to take my parents and niece when they come to visit me for a long weekend in April!